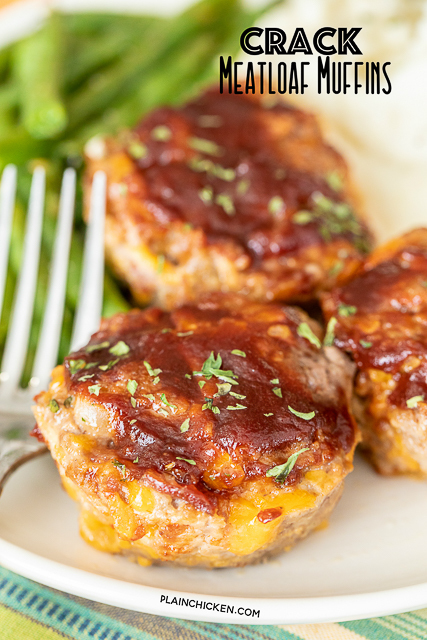 Crack Meatloaf Muffins - loaded with cheddar, bacon, and ranch! I don't even like meatloaf, but I gobbled this up! SO good! Bread, milk, ground beef, cheddar, bacon, ranch dressing mix, egg, BBQ sauce. Ready to eat in under 30 minutes. An easy weeknight meal the whole family will enjoy! 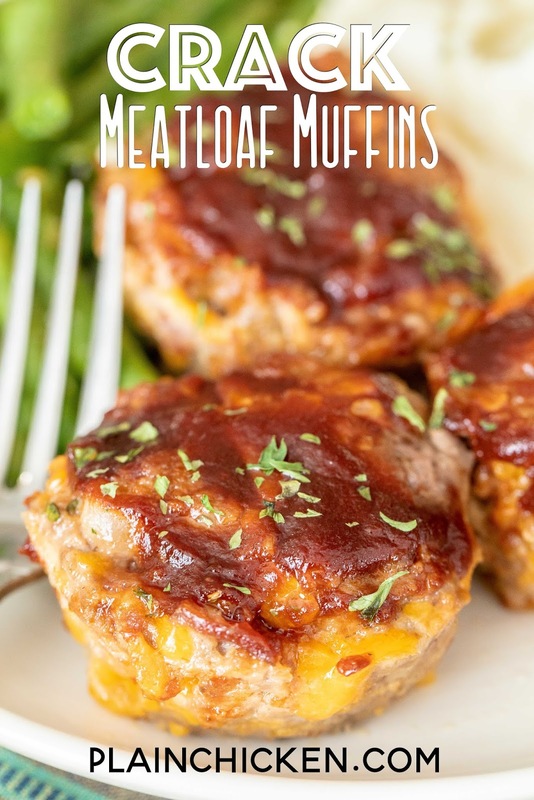 I am not a meatloaf fan, BUT I love these Crack Meatloaf Muffins!!! OMG! So tender and packed full of amazing flavor. I mean how can anything loaded with cheddar, bacon, and ranch be bad? We both LOVED these Crack Meatloaf Muffins. I loved the individual muffin servings. They were ready to eat in under 20 minutes. 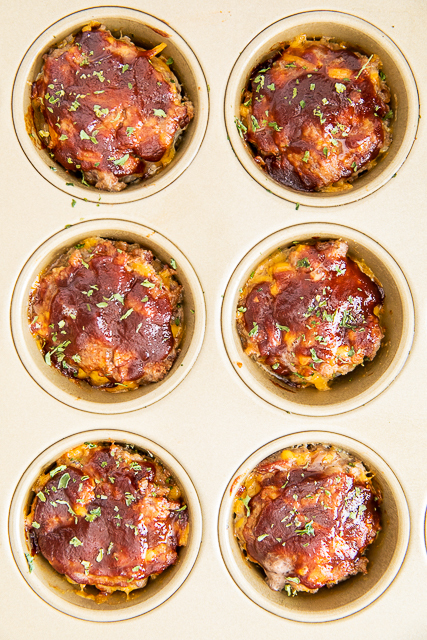 I topped the meatloaf muffins with BBQ sauce. If you don't like BBQ sauce, you can definitely swap it for ketchup. Her recipe is the only meatloaf I will eat. I reluctantly made it years ago and ended up LOVING it. It was really, really good. I decided to adapt her recipe to add cheddar, bacon, and ranch and bake it in a muffin pan instead of making loaves. It turned out great! A new favorite in our house! 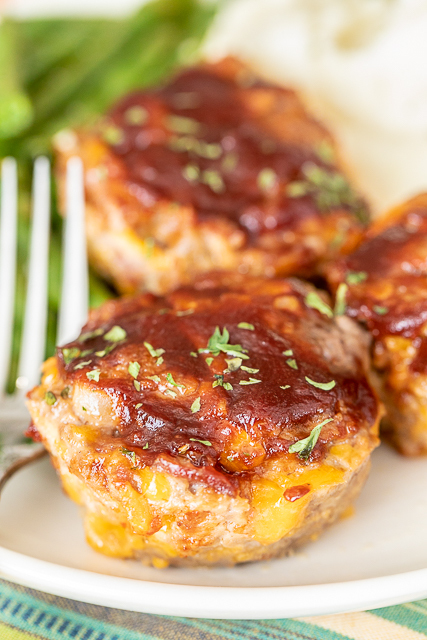 These Mini Crack Meatloaf Muffins are incredibly easy to make. Tear the bread and soak in milk for a minute. Next, add the remaining ingredients and gently mix everything together. Divide the meat mixture between the regular muffin tins. Top with BBQ sauce and bake. I had these mini meatloaf muffins ready to bake before my oven had fully preheated. SO quick and easy! You can swap the ground beef for ground turkey if you prefer. Can I freeze Mini Meatloaf Muffins? Absolutely! You can make these ahead of time and freeze for a quick meal later. You can freeze them unbaked or baked. If freezing unbaked, just thaw and bake as directed below. If freezing leftovers, thaw and reheat in the microwave. 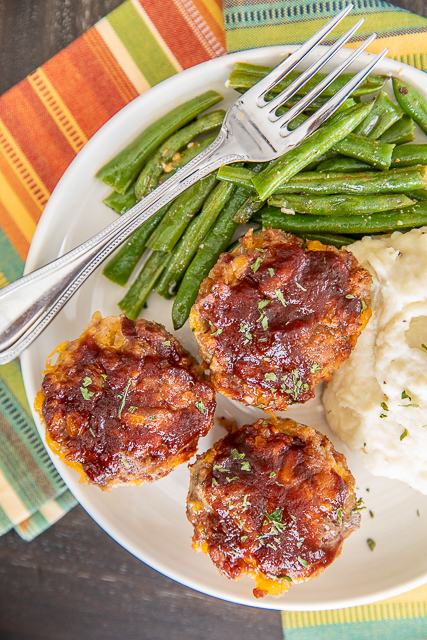 We served these Crack Meatloaf Muffins with some green beans and mashed potatoes. Comfort food at its best! I think next time (and there will be a next time) I will add some French Fried onions to the meatloaf mixture. YUM! I can not wait to make these again! That says a lot from a professed meatloaf hater. Preheat oven to 350 degrees. Spray a regular 12-cup muffin pan with cooking spray and set aside. Tear bread into pieces and soak in 1/2 cup milk. Combine bread with remaining ingredients (except BBQ sauce). Divide mixture evenly between 12 muffin tins. Top eat meatloaf muffin with BBQ sauce. Bake for 18 to 20 minutes, or until cooked through. I love meatloaf! I could never eat it because larry was allergic to eggs but now i can again!!! woohoo! Lol what happened to Larry? ?